Last month I tried my first Degustabox and really liked the food and the concept. 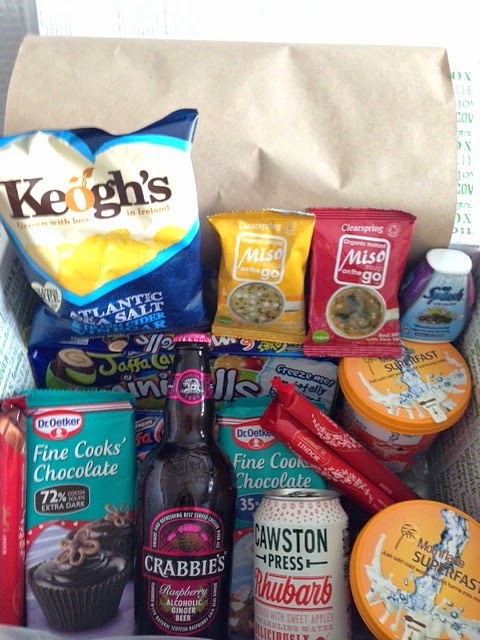 Degustabox is a monthly subscription service where you get 10-15 new food products every month. I think it's a cool idea - you get to try new products and you make some decent savings on the price too. The boxes normally cost £12.99 but they say you get double that in goods. This months box was very chocolate heavy, which we didn't mind at all! Clearspring Miso Soup on the Go - I was actually pleasantly surprised by these. I have never tried Miso Soup before but found the white miso with tofu slightly like a cross between vegetable and chicken soup. They are vegan too and the one I tried only had 29 calories. A great snack and healthy too. Lindt Lindor - A lovely chocolate hit of deliciousness! Smooth, velvety, and decadent. Words fail me... 'swoon'. Go Splash Blackcurrant Squash - This is a concentrated sugar-free squash that you keep in the fridge. I found I needed an extra squeeze in my drink though as I felt it was a little weak in the recommended dose of one per 200ml. It's hard to believe, but this little bottle will give you 30 glasses of squash. Useful to keep in your handbag. I am thinking this maybe handy in Orlando as you can get free water in the parks and then you can perk it up with this concentrate. Cawston Press Rhubarb drink - My husband tried this drink , and he states it tasted refreshing and slightly tart, "a perfect grown-up soft drink for a summers day". 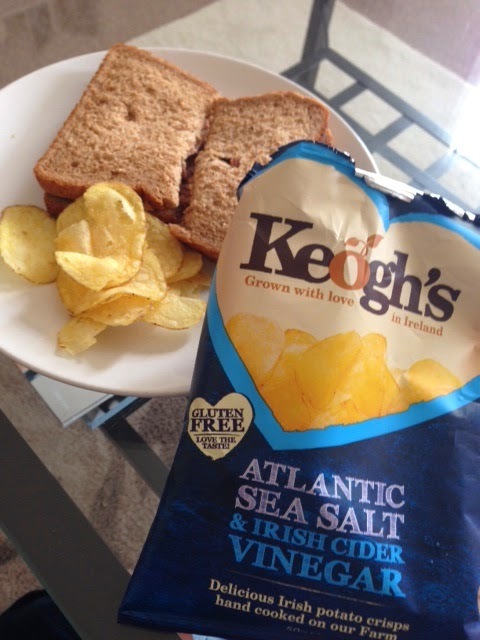 Keogh's Atlantic Sea Salt & Irish Cider Vinegar Crisps - I hadn't heard of this brand before but I have to say they were really delicious, with a distinctive cider vinegar flavour. These crisps are also gluten free, which is brilliant for those with IBS and Coeliac disease. Mornflake Superfast Raisin, Honey & Almond Granola, and Fruit & Nut Muesli - I have a soft spot for granola. I love the sweetness and the healthy addition of the fruit and nuts. These are great if you have to grab something quick on the go as they don't contain milk, only milk powder. This means you just need to add water, give it a stir and voila! Especially good if you have no fridge and brilliant to keep in your work drawer too. You won't have to search around for a spoon either as there is one in the lid. McVities Jaffa Cake Mini Rolls Tropicool and Berry Burst - I love mini rolls, and was really pleased when I saw these. The are quite sweet and although they are nice I prefer the normal chocolate mini rolls. They advise trying them from the freezer, which sounds different. Dr. Oetker Fine Cooks' Chocolate - milk and dark - Firstly I tried the milk cooking chocolate on it's own. Often cooking chocolate doesn't taste as yummy as normal chocolate but this was a very good cooking chocolate with a sweet and mellow taste. 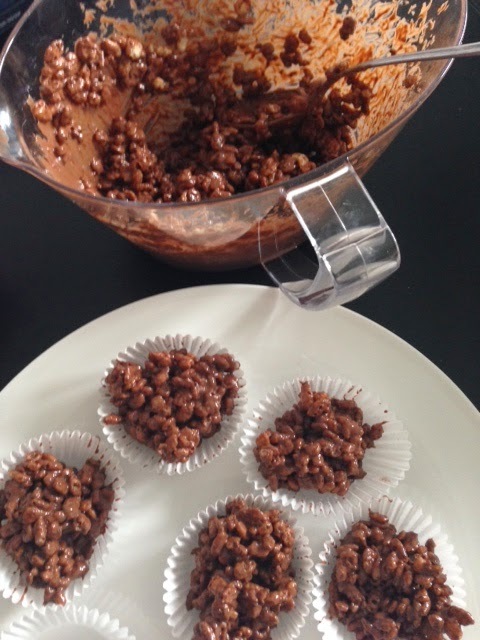 I decided to make rice crispy cakes with them, and they were delicious. I have yet to try the dark chocolate. I think it would be great for a mousse or chocolate fondant. Crabbie's Alcoholic Raspberry Ginger Beer - Another one that I was pleasantly surprised about. This didn't taste alcoholic at all, a little bit like Ribena with a ginger kick. The alcohol content is 4 % so similar to a lot of lagers. Recommended. If you like the idea of signing up to Degustabox, I have a discount coupon for you, which will give you a £3 discount, bringing the price down to £9.99. Enter code 728JP at checkout on the Degustabox website for £3 off your first order. You can follow Degustabox on Twitter here. Have you tried Degustabox? What do you think of the products this month? you get a good amount of food in there! this has made me hungry now though..
You do, I think it's great value for money. Think I would have liked that box with all the choc in it! It is a very nice box if you like chocolate, that is for sure. I have never come across this, but the name would put me off! The code above will give you a discount. Some nice stuff in there & price is reasonable too. I think the price is very good for what you get. ... and they change every month. That's a shame that you feel like that but each to their own. Thanks the cakes were yummy. That is a shame but yes great selection. We love getting our Degusta boxes! Really dislike the name though haha. At least it's a memorable name! Thanks for the comment. I think it is well priced and a great idea for a gift for someone.